The new Browse tab starts off the same as it always has, with a collection of featured banners up top to highlight new releases, Up Next artists, or newly updated playlists. After that is where things are different though: currently, the second section in Browse features Apple's Daily Top 100 playlists, followed by thematic sections like Weekend Warrior and Visionary Women, then Just Updated, Hot Tracks, and New Music, all of which come before the familiar More to Explore section where you can visit dedicated Genres, Moods, Top Charts, and Music Videos pages. Following that list of other pages, there are even more curated sections in Browse: We're Loving, Get Down Tonight, On Beats 1, and Coming Soon. Several of the newly surfaced sections of Browse seem particularly relevant to the weekend, or to a specific culturally relevant topic, so it'll be interesting to see how often Apple's editorial team updates Browse with new sections to explore. The tab was refreshed regularly before, but it contained much less content than it does now, so there was less reason to check it out often. Now, however, it could become a near-daily destination if Apple updates it often enough, similar to the App Store's Today tab and Apple News' Digest tab. Exposing more content from Apple's editorial team and making it more accessible to users is a good thing. Personally, the one drawback of this change for me is that because there are so many sections inside Browse, it can be more cumbersome to find my favorite sections. For example, if someone visited the Genres screen a lot, they now have to do a lot more scrolling to get to that option. Ultimately, this is the same basic problem I've had with Apple Music's For You tab for years: amidst the wealth of content available, only a select few sections are my favorite, but I currently have to scroll through a lot of content I don't care about to find those sections. 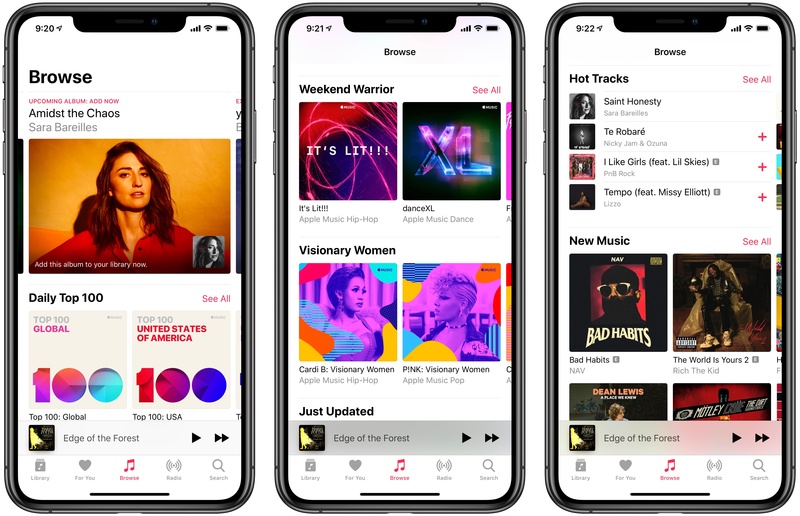 My biggest wish for Apple's Music app is that it would enable custom reordering of the For You and Browse tabs so that users can put the sections they care about up top, similar to what's possible in the third-party client Soor.